Sometimes I just need to get my art out of my art journals and on to some canvas. However, a larger canvas can be a bit intimidating to start on! Even an 8" x 10" one can seem daunting if canvas painting is new. I found these adorable 4" x 4" canvases at my local art store and knew they were perfect for a fun project. I've always wanted to try diptych art or triptych art and these little canvases were the perfect place to start. I created both of these paintings side by side as if they were one piece. I think this helps continue the flow from one piece to the other to ensure they are in harmony with one another. I knew I wanted to include some Art Pops™ Stickers and some stamping for a really layered feel. I've been hung up on this combination of blues and pinks together for a while now, so I ran with it! This diptych art took me all of 30 minutes to complete! What a great project for an afternoon when you have a few minutes. These would make a great gift or to display yourself. If you have 30-60 minutes, then give it a go! have fun creating your own mini canvases! Is there an aspect of mixed-media art that you always avoid? Why? I don't do a lot of collage or layering of papers in my work. I'll add some papers, but I generally don't like having too much bulk to my work. I prefer to add layers with paints and other mediums. I think I find the papers and bits of string and such too much, which is funny coming from me. I also really like a more watery look to my work, which means I use water often with my paints and pens. That doesn't typically play too well with lots of papers and bits on there. 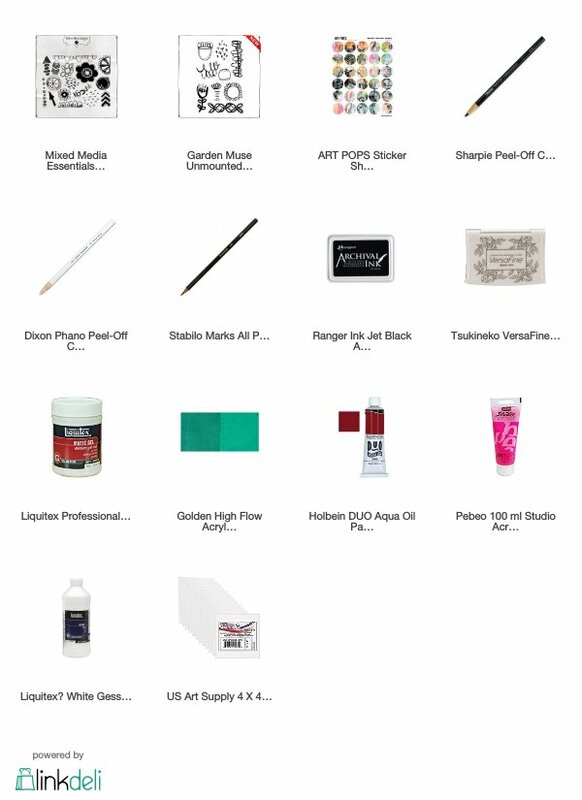 What creative tool/supply are you obsessed with right now? I am totally ga-ga for all my pencils, markers and pens right now! I find myself reaching for them more & more lately over my paints. It's exciting to be drawing and making marks in new ways.